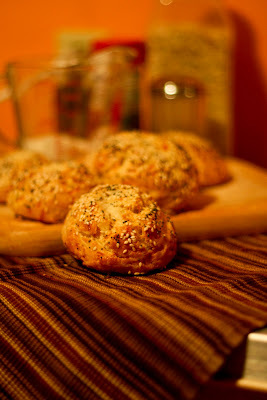 This is one recipe that my family likes a lot but personally I have a reason to like it even better- they are the most easy bread rolls you can make and on top of that they are without yeast. 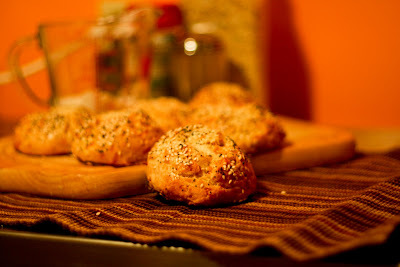 Dobrudzhanki are very popular in Bulgaria, especially as breakfast rolls. They are named after a Northern-East part of Bulgaria - Dobrudzha. They are also popular as Marzelivki ( which means "lazy ones"). Toppings and fillings as you like- sesame, poppy seed, dry onion, bacon etc. Preheat the over at 375 or 390 F ( depends on the oven). In a mixer bowl mix the yogurt and baking soda. It will make a reaction, because the yogurt is sour, so it is perfectly normal to notice the bubbles that are going to come out on top of the mixture. Add the salt, vegetable oil and slowly add flour while stirring. Add the Parmesan and/or the other fillings and stir by hand. Pour a little bit oil in a cup and get your hands oily as much as possible, then take a handful of dough and shape it as a roll. Place the roll on a greased pan, place the toppings you like and a small piece of butter on top of each roll ( you can push it a little bit down). Bake for 20 min or until golden on top. Serve warm! 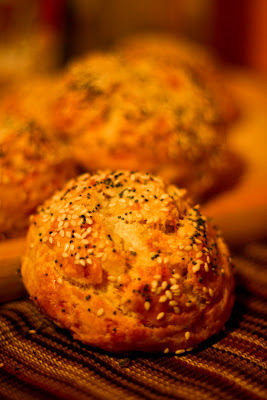 Kozunak - Bulgarian Sweet Easter bread-recipe updated!